Smallwood State Park, along a tributary of the Potomac River, offers a unique mix of historical significance and modern-day boating conveniences. The 628-acre park is named after General William Smallwood, a Revolutionary War officer who was the fourth governor of Maryland. His plantation house, called Smallwood's Retreat, has been restored and is open to visitors. The house reflects Smallwood's lifestyle as a 18th century gentleman planter. The park also offers a marina, boat-launching ramps, a picnic/camping area, and nature trails. Located on the Mattawoman Creek, the marina provides excellent access to fishing on the Potomac River, which is just a mile away. Smallwood also hosts craft demonstrations, military exhibitions, and other special events throughout the year. Smallwood State Park is open year-round. From April to October, the park's hours are 5:00 AM to sunset. From November to March, the hours are 7:00 AM to sunset. Smallwood's Retreat House is open on Sundays from 1:00 PM to 5:00 PM, April 29 to October 7. Arrange a tour with at least two weeks' notice. Day use service charges are $3 per person on weekends and holidays, April through October; $3/vehicle all other times (honor system system in effect when toll booth is not staffed). Out-of-state residents add $2 to all day use service charges. Smallwood State Park is open year-round. A launch service charge of $10 per day for in-state visitors and $12 per day for out-of-state visitors is in effect year round. Golden Age Passes are not accepted for launching services. Fishing: One can fish from the shore or from several stationary piers located at Sweden Point Marina. Fish that could be caught include: largemouth bass, catfish, white and yellow perch, and carp. A Chesapeake Bay Sportfishing License is required. Recycled Tire Playground: Children ages 5-12 can enjoy climbing walls, a ten-tire bouncer, tire swings, a fish music wall and much more. Through a cooperative project between the Maryland Department of Environment, Maryland Environmental Service, and DNR, funding was made available for the construction of a community built tire playground at Smallwood. In a four day period, a playground with the theme of fish and history was created. The playground entrance features art murals by Mattawoman Creek Art Center artists Bob Kenyon and Gene McCandless, and the fishing theme can be seen throughout the playground as over 65 hand-painted fish dot every piece of equipment. More than half of the structures are accessible to children with disabilities. Picnicking: Picnic tables and grills are available at the Sweden Point Concession area and at various points in the historic area of the park. Three pavilions are available by reservation. Hiking: The trails at Smallwood meander through the hardwood forest, passing many natural and historical points of interest. The entire trail system is approximately 2 miles in length with several marked exit points if the walk becomes too strenuous. Historic Area: Smallwood's Retreat House, a restored 18th century tidewater plantation and a 19th century tobacco barn are open on the first and third Sundays, May through September, from 1 to 5 p.m. Tours can be arranged with a minimum of 2 week's notice. A special Colonial Christmas open house is held in December and features the house decorated with fruits and greens as it would have been in Colonial times. Camping: Fifteen family campsites with electric hook-ups are available under the canopy of a hardwood forest. Four camper cabins sleep four and two cabins sleep six and have heat and air conditioning. Cabins #17 and #18 overlook Mattawoman Creek. Cabins #16 and #19 are close to the creek, but do not have a water view. Cabins #20 and #21 are located as you first enter the campground area. A picnic table, lantern post and fire ring are provided on each site. Bath house facilities with hot showers are also provided. Sweden Point is located on the Mattawoman Creek, a tributary of the Potomac River. It is approximately one mile from the marina to the Potomac River. Sweden Point Marina has 50 slips and excellent access for fishing on the Potomac River. A dry storage area for trailerable vessels contains 50 spaces in a secure lighted area. Owners can access their vessels during park day-use hours only. Concessions - Sweden Point Marina features a small store which provides dock-side fuel (gas, no diesel), ice, bait and tackle, snack foods and souvenirs. The concession is open seasonally, call in advance for current hours of operation (301) 743-7336. The park's Marina Services Building can host parties and meetings. It features a kitchenette/prep area, a large room overlooking the Mattawoman Creek (77-person capacity), an outdoor deck, and restrooms. Fifteen family campsites with electric hook-ups are available under the canopy of a hardwood forest. Four camper cabins sleep four and two cabins sleep six and have heat and air conditioning. Cabins #17 and #18 overlook Mattawoman Creek. Cabins #16 and #19 are close to the creek, but do not have a water view. Cabins #20 and #21 are located as you first enter the campground area. A picnic table, lantern post and fire ring are provided on each site. Bath house facilities with hot showers are also provided. Sweden Point Discovery Center -- The Sweden Discovery Center offers many opportunities for children of all ages to explore their natural surroundings. The discovery center features live animal displays including snakes, toads and turtles, interactive learning stations such as a fossil dig sandbox, and more. Smallwood State Park offers an accessible fishing pier, marina office, campground bathhouses, shelters, and day-use comfort stations. Pets are allowed in all day use areas and in the campground. Pets must remain on a leash at all times. Smallwood State Park was dedicated in September 1958, as a historic park. At the time, the park consisted of 30 acres of land which included the Retreat House and the grave site of General William Smallwood. Smallwood reached the rank of major general for his service as a patriot leader during the Revolutionary War. He was elected Governor of Maryland in 1785, and later served in the Maryland Senate. During his term as the 4th Governor of Maryland, Maryland ratified the Federal Constitution. The plantation house reflects Smallwood's lifestyle as a gentleman planter. Sweden Point Marina was not always known as Sweden Point. At one time it was referred to as Sweetman's Landing. The area that is referred to as Grinder's Wharf (which is only a few exposed pilings today) was built on a naturally deep water channel in the Mattawoman Creek. The Grinder family was one of the areas major brick manufacturers in the Chicamuxen area. They in turn used Grinders Wharf to ship their brick out to the wholesalers. In the mid 1800's the wharf was used by the Washington Steamship Lines on the Potomac. The steamers would pick up water on their journey south to the Chesapeake Bay. 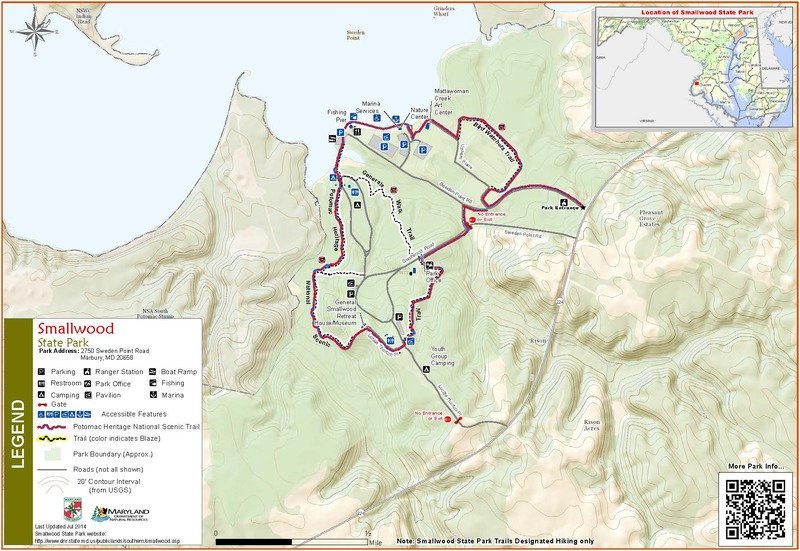 A park map is available from the park office.